Dr. Orbe, a board-certified pediatrician, received her medical degree from State University of New York Downstate Medical Center College of Medicine. She then completed her residency in pediatrics at New York-Presbyterian Morgan Stanley Children’s Hospital. Prior to joining Westmed, she was in private practice for 17 years with Mount Sinai Doctors/West Care Medical Associates, seeing pediatric and adolescent patients. In 2017 and 2016, Dr. Orbe was a recipient of the Cullman Family Award for Excellence in Physician-Patient Communication. This award goes to clinicians who were ranked in the top 1 percent nationally in provider communication as measured by the Centers for Medicare & Medicaid Services CG-CAHPS patient experience survey. She has been consistently in Castle Connolly Top Doctors New York Metro Area. Dr. Orbe is fluent in Spanish in addition to English. Dr. Orbe has been my daughter pediatrician since she was born. My daughter feels very comfortable and trusts her. We have followed Dr. Orbe from NYC to Purchase. She is a wonderful good doctor. Dr. Orbe is very knowledge, excellent doctor. We have been with *Dr. Jessica Orbe for 15 years. She is our doctor for our two kids. We know her from the NYC office. When she moved to WESTMED, we followed her there. We have the highest confidence in *Dr. Orbe. Dr. Orbe is an excellent doctor. I appreciate her thoroughness, dedication, & her genuine commitment to her patients. Dr. orbe is the best doctor; she is knowledgeable, caring and respects my point of view, she includes me in are decisions regarding my son. I feel understood and supported, I also believe she has my family's best interest in mind. We followed Dr. Orbe from West Care in Manhattan. She oversees the care of both by children from birth. She is a phenomenal pediatrician. Best doctor we've had for our children. Very happy with her and the quality of care she's provides. Courteous and professional. 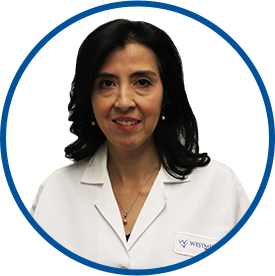 *Dr. Orbe has been our pediatrician for 14 years when she moved over to WestMed, we made the decision to see *Dr. Orbe at WestMed. She is the reason why we came here.